This photo left me breathless when I first saw it! I have always been enamored with lamp posts. That love probably dates back to my childhood when I used to watch the animated version of The Lion, the Witch & the Wardrobe! Now they make me think of Paris. Le sigh! Le sigh indeed! I love Paris! And I also love that streetlamp! 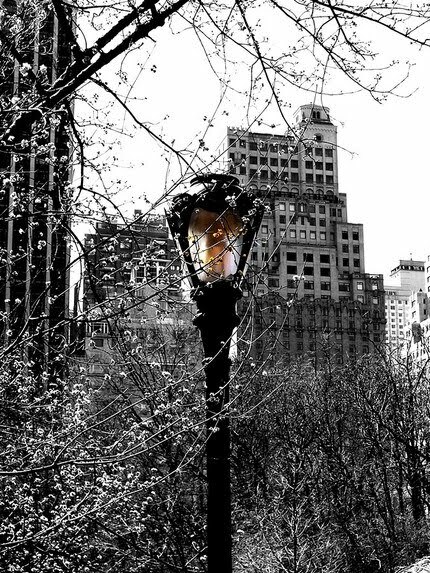 It actually reminds me of a streetlamp out of Thomas Kinkade's works. For some reason this picture reminds me of fall. I would totally frame this in a bright red frame. Gorgeous shot! This photo is so full of promise. You could stare at it for hours and imagine all sorts of things. Want to "go". Sorry about the typo.